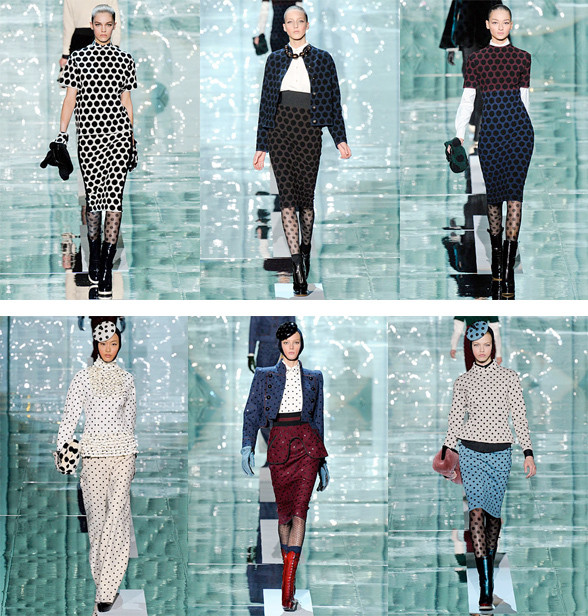 When I first saw Marc Jacobs Fall 2011 runway show I wasn't sure how to felt about all his polka dots on polka dots. Was he a mad genius or was it spotted madness? Well the more I thought about it and inspected the collection the more I thought he was a mad genius. I decided to pull this trend off myself -- even though playing with different patterns or even matching patterns on myself isn't my favorite but sometimes you can't help but try a trend to see if it sticks. Come on, fashion is all about having fun! To pull this trend off I decided to pair up two different sized polka-dots. There is something about mixing two different sizes of the same pattern that seems less frighting to me, maybe it's the contrast that I like and not being to matchy matchy. So if you're like me and afraid (or usually don't like playing with patterns) try playing with contrasting sizes. I went with a bigger sized dots with the top and smaller sized dots for the bottom. Everything else was a solid color -- matching greyish shoes for the top and dark tights. Stick with small accessories. This Forever21 necklace adds just the right amount of sparkle to the outfit. You don't want to overload the look with big accessories or a lot of accessories since matching prints can sometimes be overwhelming. I must say this is one of my new favorite outfits. It's playful and fun yet chic and still work appropriate. I also love that this trend can work with all ages a longer pencil skirt with a fitted top works for a sophisticated lady while a mini and a loose top is young and flirty. What do you think about the polka dot on polka dot look? You look gorgeous here. Love the christmas tree in the background too. Different sized polka dots - what a good idea! Love your rendition.